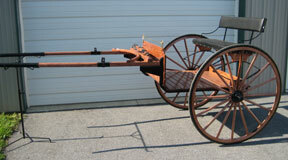 Shady Lane Wagons regularly carries, in stock, refurbished carriages, wagons and sleighs of all kinds for sale. 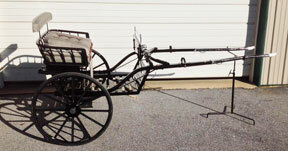 Restoration services are also available for your own horse drawn vehicles, antique or contemporary. 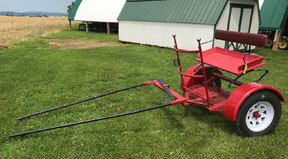 Please call or visit us for more information about our restoration process. Whn contacting us about a particular carriage or item on this website, please be sure to refer to the catalog number listed in red. 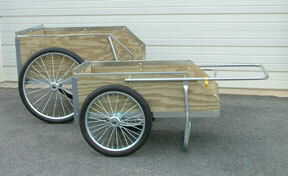 Hand Carts - #20 Garden Cart, 24x40 bed, 12" sides, 20" wheels. 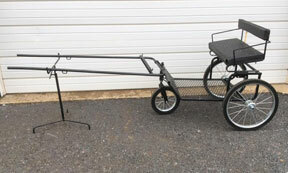 #26 Garden Cart, 32x48 bed, 16" sides, 26" wheels. UPS available. 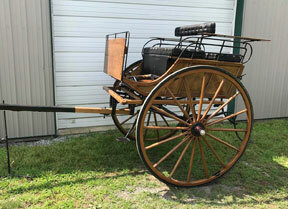 #2038 - Apple Cart - May be ordered natural wood, or stained or painted. 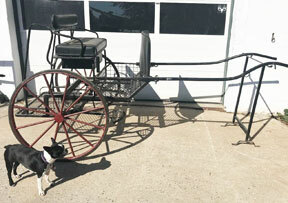 comes in mini, pony, cob, and horse sizes. Other colors are available. 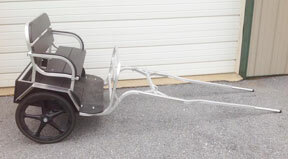 #2014 - Mini Breaking Cart - available with wood wheels or wire spoked wheels (shown). Your choice of seat fabric and color. #2015 - Jog Cart - Metal frame, wooden shafts, shown here in blue with natural wood shafts but other colors are available. Rear entry. 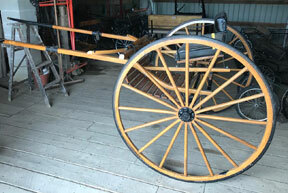 #2016 - Mini Meadowbrook Cart - available with wood wheels (shown) or wire spoked wheels. Your choice of seat fabric and color. 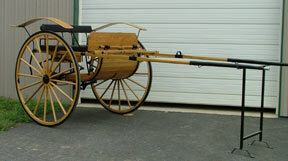 #2017 - Meadowbrook Cart - Wood, natural stain, shown with wood fenders. Perfect for pleasure or show. Rear entry. 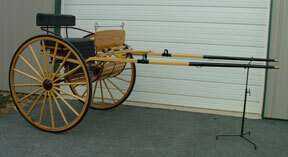 Comes in mini, pony, cob, horse and draft horse sizes. 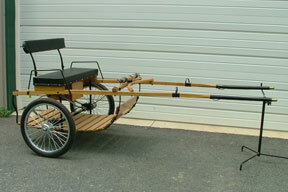 Optional accesories include flush hubs, hydraulic brakes, pin-striping, and tufted upholstery. #2018 - Show Cart - Wood, shown painted white with imitation patent leather dash and velveteen seat, draft size. Rear entry. 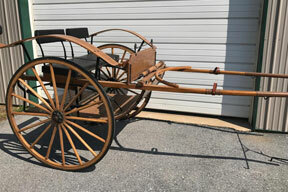 #2019 - Road Cart - available in horse or pony size, natural finish or painted, choice of upholstry. Call for Price. 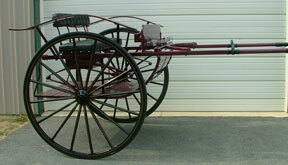 #2020 - Meadowbrook Cart - Painted a rich, plum-burgundy color. Black vinyl seats. Horse size. Other colors and sizes available. 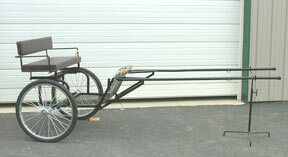 #2023 - Easy Entry Cart - mini through horse size. Call for Price. patent leather fenders and dashes; cup holders; rein rails; patent leather shaft wraps; storage boxes; shafts or poles; and more. 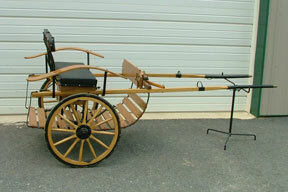 We also carry forcarts. 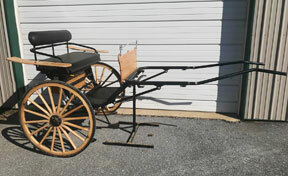 See our Contact page for more information about in-stock vehicles and saddles! All prices listed herein are not guaranteed accurate and subject to change. Please confirm while ordering.